Reminders of “genie in the bottle” @codepo8 ▪ Fulfills our wishes seemingly with invisible magic ▪ Useful, and feels too good to be true ▪ Once released, may have a dark, sinister edge to it ▪ Hard to put back into the bottle. Leaving invisible marks… @codepo8 ▪ By using other people’s machines and infrastructure, we leave traces ▪ This allows companies to recognise us, and accumulates a usage history ▪ This leads to better results, but can leak data ▪ We should have more transparency about what digital legacy we left behind. Find own patterns and collate them Clustering @codepo8 ▪ Photo tagging and ordering ▪ Document analysis ▪ Comment filtering and triaging ▪ Video optimisation dependent on content. 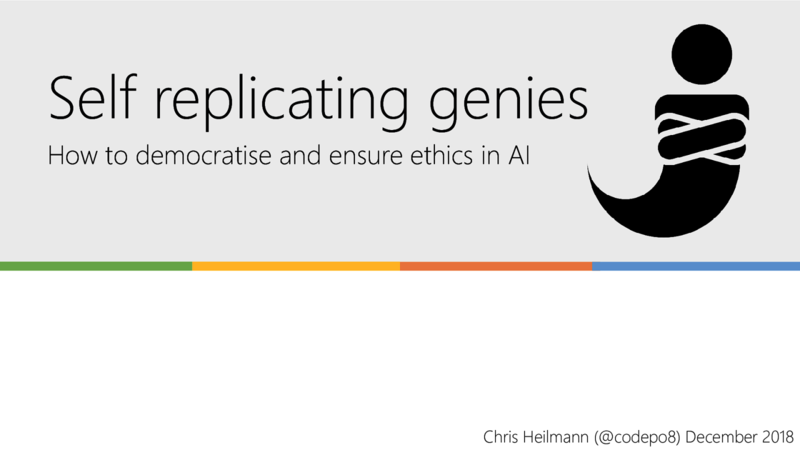 View Self replicating genies - How to democratise and ensure ethics in AI on Notist. There is no question that we are living in the age of automation and machine learning. Humans and sensors create far too much data for humans to comprehend which is why we need machines to make them digestible for us. The problem is that machines don't have any ethics and technology is still seen as magic by people who give away far too much of their personal data without knowing who listens. To make the AI revolution work we need to build ethical systems and install an ownership in users.